These are three really simple questions which should be very easy to answer. But just take a look in your fridge and store cupboard and work out what percentage of the food you are intending to eat readily allows you to answer those three questions. The serpentine complexity of much of our food chain makes it quite a challenge. The quest is not helped by the fact that many food producers go to great lengths to deliberately prevent us from finding out what we’re eating. Right now in the USA, for example, a growing number of States are holding referenda on whether to pass legislation requiring foodstuffs containing genetically modified organisms (GMOs) to be labelled as such. Global GMO producers and promoters like Monsanto, DuPont, Dow AgroSciences and Bayer have done their best to sway the results of these plebiscites, spending millions of dollars in aggressive campaigning against the proposal. They are willing to spend big to make sure American citizens remain in the dark about whether their food contains GMOs. One explanation is revealed in this telling quote from a spokesman for one of Monsanto’s many subsidiary companies, “if you put a label on genetically engineered food, you might as well put a skull and crossbones on it”. What is happening in the United States represents, I believe, a small but significant consumer backlash against the power and secrecy of the food giants. What we choose to eat is one of the most important daily decisions we make, and we should have the right to know the answers to those three basic questions each time we do. Time for the stripey apron. Recently I used the last of the forced rhubarb from my allotment plot, the Circus Garden to make a lovely rhubarb and vanilla jam. The natural sharpness of the rhubarb pairs beautifully with the aromatic subtle sweetness of vanilla, and the combination works perfectly in this variation on a classic British tart. It’s a quick and easy jam to make, but you could of course substitute an inferior shop-bought jam in this recipe if you really must. 1. First make the short crust pastry. In a mixing bowl combine the flour, salt, sugar and butter and mix until it resembles fine breadcrumbs. Add the eggs and mix again until the mixture produces a smooth dough. Wrap this in cling film and flatten slightly, to make rolling easier later. Place in the fridge for at least 30 minutes. 2. For the frangipane, place the butter and caster sugar in the mixing bowl of a food processor and mix until light and fluffy. Add the eggs gradually, mixing to combine. Next add the ground almonds and the plain flour and mix, making sure all the ingredients are fully combined. Set to one side. 3. Preheat the oven to 190 C (375 F, gas mark 5). 4. Grease a large flan dish. Retrieve the pastry from the fridge and roll it out to a thickness of about 3mm. Line the flan dish carefully with the pastry and trim it to leave an overhang of about 1 cm. (Any unused pastry can be frozen at this stage for use in the future). Prick the base and sides with a fork and line the pastry in the flan dish with baking parchment and baking stones or beans. Bake blind in the preheated oven for 10 minutes. Remove from the oven, leave to cool slightly and then remove the parchment and baking beans. The edges of the tart will have shrunk slightly, but now you can trim it neatly to the height of the flan dish with a sharp knife. 5. Spread the rhubarb and vanilla jam over the base of the tart, and carefully spread the frangipane on top. Level out and bake for an initial 15 minutes, at which stage scatter the flaked almonds across the top of the tart. Return to the oven for a further 10-15 minutes or until the tart is a lovely golden colour. Serve slices of the tart with vanilla ice cream or creme fraiche. Slices of the tart are also rather good eaten cold, accompanied by a cup of coffee or tea. Hi Angie. Thank you. The tart is just as lovely as it looks, and not too difficult to put together. To force my rhubarb I simply upturn a battered old metal planter over a rhubarb plant at the start of the year and the spindly shoots are ready for harvesting a few weeks later. 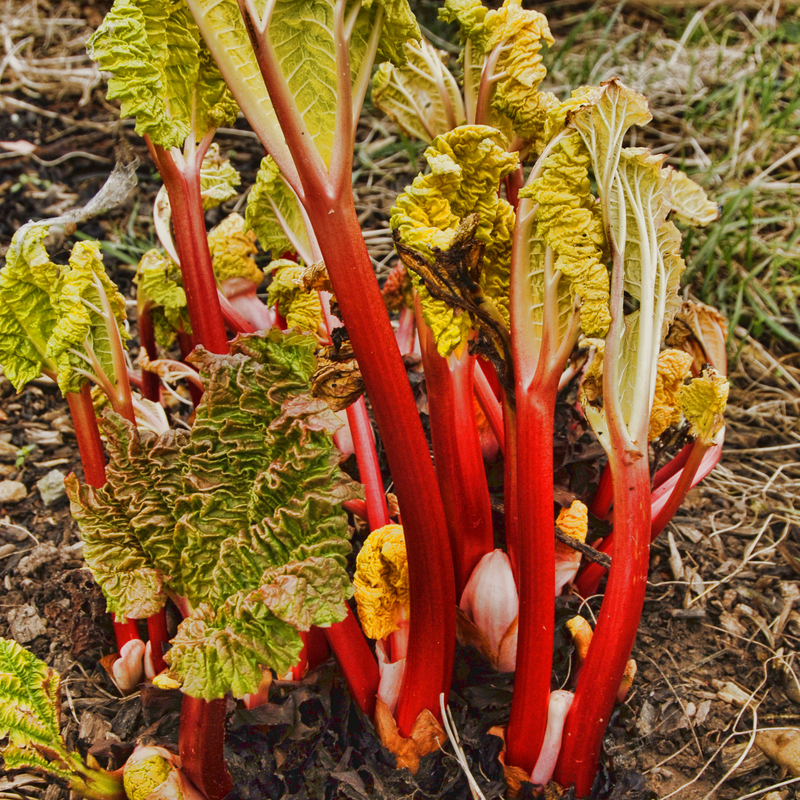 The only note of caution is that the process does weaken the plant, so it’s best to choose a different rhubarb plant to force each year.